lighting effect done with a simple brush. I glossed up the scan, added more highlights and shades to them. looks awesome, nice job on it! 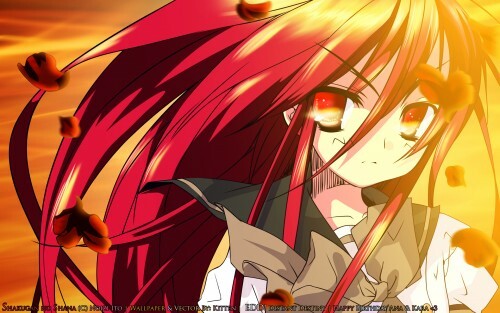 Shana-chan <3 I want to give her a melon bread :D It looks awesome! I like the extra lighting effects you added a lot! It really does go well with the background! I like everything about it! Shana! Sunsets! Petals! i love how you vector as usual + the lighting effects. but well, the lighting on the right side really washes out the wall instead of illuminating that part. and i think the brushwork in the eyes are a bit too messy to go with the smooth gradient look that shana normally carries. I don't like the shading on the bow, but I like everything else, so... meh, too braindead to critique right now. lol. Oh!, hermoso wallpaper de mi querida shana!, ty! I need to this wall. wow...she is HOT! thanks for sharing!